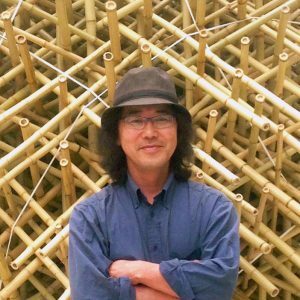 Geometric Artist: Born in Nagano, 1960 and living in Shizuoka. Graduated from the Department of Architecture, Kyoto Institute of Technology. Searching for any form around either material or immaterial one. 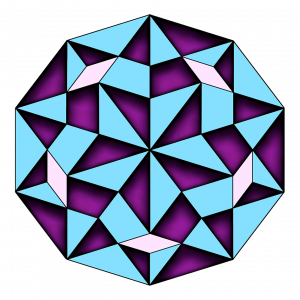 Primarily, a geometric artist mainly using the Fibonacci sequence, Penrose Tiling and the Golden Ratio, as well as general quasi-periodic structures based on continued fractions. Lover of the ecology of the bamboo as an attractive material. Akio Hizume’s Fibonacci Turbine and Fibonacci Helicopter. 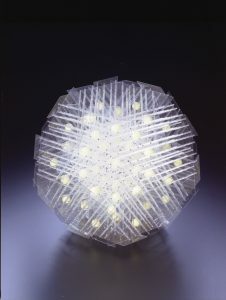 GOMAGARI (1990) Quasi-Periodic Five-Fold Chiral Lattice.